Since the early 90's, Swedish performance artist, Gustaf Broms, has developed a symbolic language to better understand himself. His creative career has evolved from the time we were colleagues at the Richard Avedon Studio in the late 1980’s to his own photography, film-making, sculpture, collage-creations, and music-making; up to what he is most famous for now - performance art. There is always a slight frustration making work with your own body, that you never "see" the work, only a vague feeling from the interior, the experience from "the other side" is always hidden. One day I rigged a camera with a time lapse setting to get a sense of the formal aspect of an action. A durational work with the head coming out of a table, to create a situation where there would be a tension between being object and being subject. Even if every work initially seem to be new and independent of previous works, there is clear thread of playing with perceived borders, moving between identifying with MIND, as an experience of life as an intellectual process, and being NATURE, as identifying with being body. The focus on this "gap", seem to reappear, and I wonder if I am trying to make a work to heal this gap? I understand this rupture, as if our senses have evolved as tools to preserve the biological vehicle, rather than to read reality. This view of the world, based on the senses, creates an experience of seperation from our environment, this misconception has taken over our sense of place in the universe? A confusion also rooted in human arrogance perhaps? Can I trace this "wound" as a root of conflict? Whether I look at what human do to human, human to other non-human beings or human towards environment? An illusion of border of skin as border of self - creates illusion of "OTHER" ? Even if experience and science tells me that existence is more perforated, no clear beginning or end between beings and environment? Air and water flow through me, inside and outside are superfluous? In whatever form my work is presented, ephemeral or material, there always seem to be BODY SPACE-TIME that are central, both as materials and as content of the work. In my studio there is a lot of organic matter, beings in different states of decay and transformation, to insert my own head in this scene, made a clear echoe to the Vanitas tradition, the first image in this series is a conversation with that tradition. Those paintings that are concerned with time and space (change and emptiness) the dialogue came very natural. Seeing this first image as an object (a print), I was again reminded of the power of a photograph, after years of not working with this form. Even though my first steps into making visual works, was being trained as a photographer. After pursuing image making through light and chemicals, a feeling of frustration slowly grew with the constrictions of 2 dimensions. 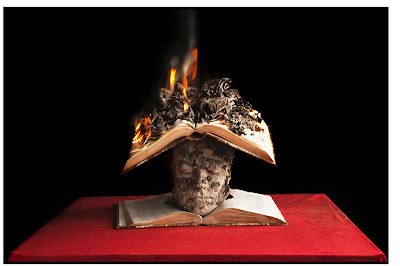 In 1993 in an act of sheer desperation, I burnt all my works, and through this fire, realized the power of the ACTION. The intensity of this experience eventually moved me towards making actions and performance work as my main form. "Tomhet, idel tomhet, allt är tomhet"